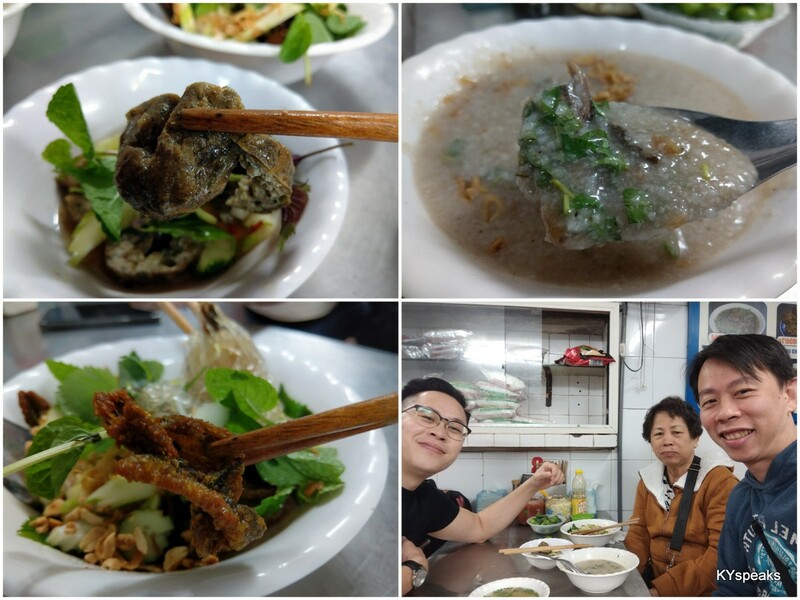 It is often my mission to taste food that are not available locally whenever I travel to another country, and that usually means eating by the streets and at some of the more dodgy areas the locals frequent. 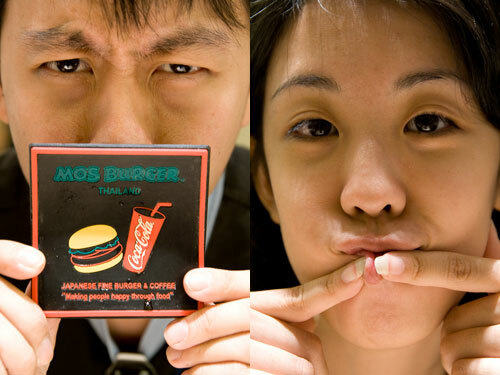 However, unique perhaps only to Malaysia in this part of the world, there are several big restaurant chains that altered their menu to be Muslim friendly (Tony Romas, Subway), or skip the country entirely. One of such example would be Mos Burger. KY & Mell waiting for our Mos burgers! 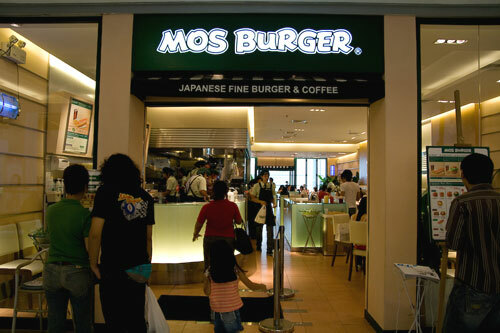 On our 3rd day at Bangkok, we found ourself at the biggest Mall in town, CentralWorld , Mell and I decided to have a go at Mos Burger for lunch. Naturally, we went for two different pork burgers. I chose the ginger pork rice burger, while Mell ordered the pork cutlet burger set. We paid and then sat down patiently and waited for the burgers to be served. The rice burger “buns” and the ginger pork was rather awesome. 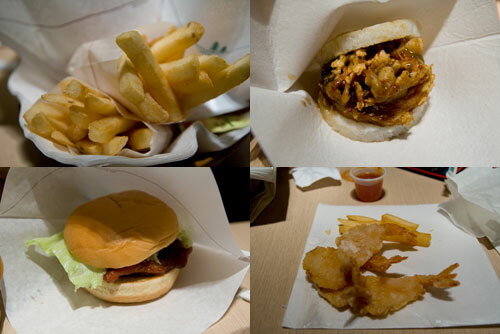 The feeling was rather like having a ginger pork bento with Japanese rice, but in a convenient burger format. I can eat this kinda things 3 times a week. Mell’s pork cutlet burger was equally impressive as well. 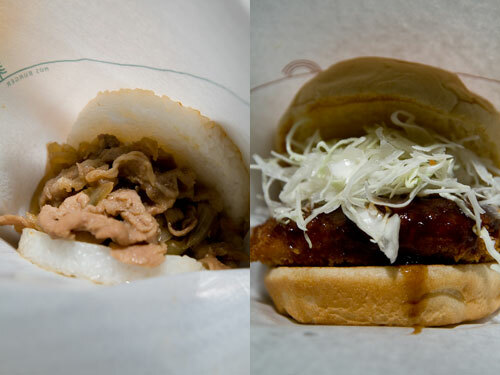 Soft buns, generous amount of shredded cabbage, and the delicious pork cutlet with the savory sauce. The lady was well satisfied. Our sets came with soft drink and a small serving of fries. The fries are slightly thicker than your standard McDonald’s, and less salty too. They’re probably healthier, but I wasn’t too impressed with them. Then again I was never a fan of fries since I the stint with McD over 10 years ago. 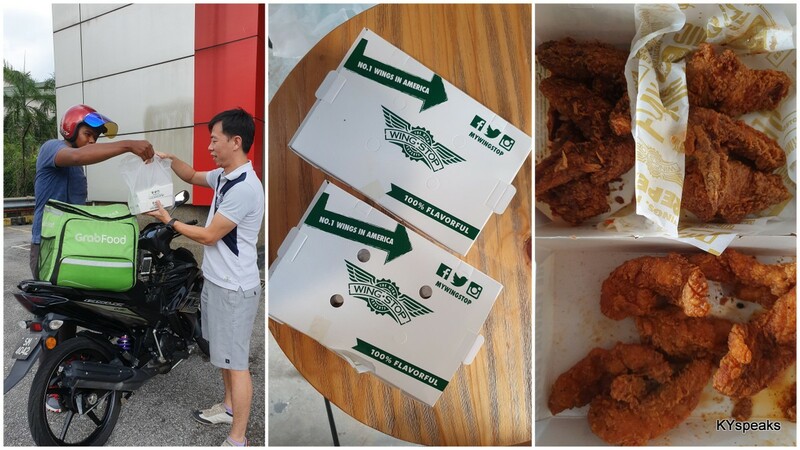 The set meals we ordered were 109 and 129 bath, or roughtly RM 11 and RM 13. A little bit more than BK and McD’s but the quality of burgers more than made up for the prize difference. 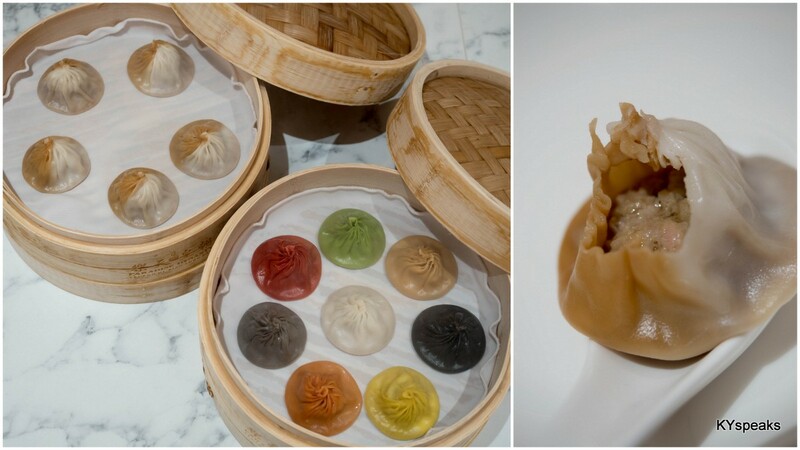 If you find yourself at the center of Bangkok, head to CenterWorld and give this a try. There is also a branch at Siam Paragon’s food court level. Air Asia – Now Everyone Can Sit Separately! Some of you might know by now that the days of rushing to board an Air Asia flight just to get “good seats” is over. The low cost carrier actually assign seats by the time you check in. No need for that Xpress Boarding gimmick anymore, a relief, right? You see, now there is this wonderful offer from Air Asia aptly named “Pick A Seat” service. For RM 25 per person, you get to choose the hot seats (first 5 rows, and the 2 rows next to emergency exits) that comes with extra leg rooms. Well, we figure our legs aren’t exceptionally long, so we chose the standard seats. On the way to Bangkok, everything was well good. On the way back, we got this little surprise thrown to us by the airline. 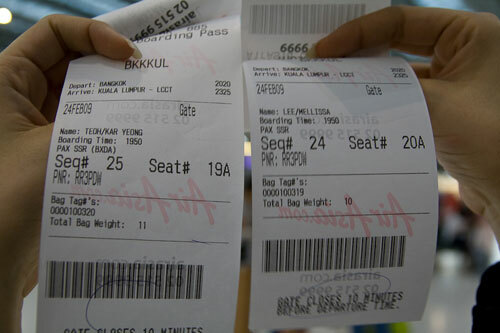 Despite checking in together almost 3 hours in advance, we were assigned SEPARATE SEATS 19A & 20A. Naturally Mell and I thought it must be a mistake, so we asked the ticket issuing officer if we could be seated together. The answer was very simply, no. We then went to the sales counter (there was no customer service counter at Bangkok Airport for Air Asia) to state our case and tried to get it all sorted out without avail. The lady politely asked if we want to have the hot seats, or we could talk to the ticket issuing lady again. Ding dong. We weren’t exactly very happy with their explanation of how their system works, and why we can’t get seats that are next to each other cos they are already “assigned”. I even asked them to show if the seats are all assigned to those who paid extra with no free adjacent seats anymore, but of course my request was rejected. So we boarded the plane and seated separately. Apparently there were quite a few parties who had the same treatment. People started exchanging seats as soon as everyone boarded the plane, and we eventually moved to a row of empty seats at the back of the plane. What I want to know is how that seat assignment algorithm in their system is written. 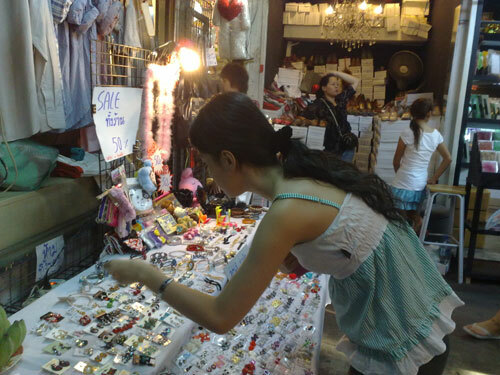 The one place at Bangkok every girl must visit is of course, the Chatuchak weekend market. 15,000 stalls selling everything from accessories, clothes, furniture, decorative items, to pets and food. Everything that you ever need, you can find them here, and usually cheap. Our first trip to Chatuchak was on Saturday just before noon. 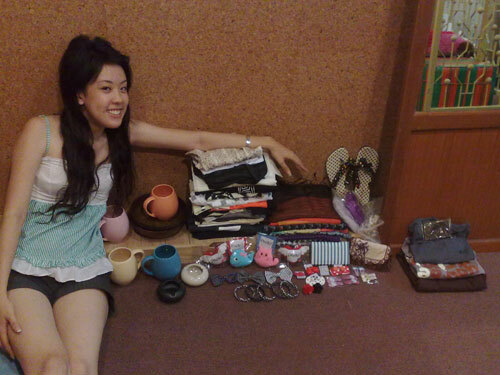 It was way too hot and the girl somehow decided to buy 4 pieces of mugs for 15 baht each (a very good deal, I must agree) among other stuff which kinda made carrying the spoils a bit too tiring. We ended up spending half an hour for foot massage, nice! We went there again on Sunday evening after spending some time in the city. This time around we got quite a bit more than previous trip (but no clay kitchenware this time), Mell got some 20 pieces of clothes and I got myself 3 pieces yey! After 3 days at the funky room 202 “Hong Kong Pat”, we moved to room 303 “Medicine Machine” at Reflections Rooms. Instead of the converted shop lot, this room looks like it was a small office, about the size of 2.5 standard hotel room. Will have more pictures posted soon. 2 more days in Bangkok, and it’s been as awesome as it can get. I think a trip to the city is in schedule tomorrow, perhaps to catch another movie and visit the Ocean World at Siam Paragon. Be back soon with proper naisss photos! We arrived at Bangkok late last night after a very noisy flight that reminds me very much of Puduraya. After escaping the slaughtering attempt by “official” airport taxi that asked for 1100 baht for a trip to the hotel, we took a standard cab and paid less than 500 baht to Reflections Rooms at Pradipat Rd. Mell & KY says Hi! 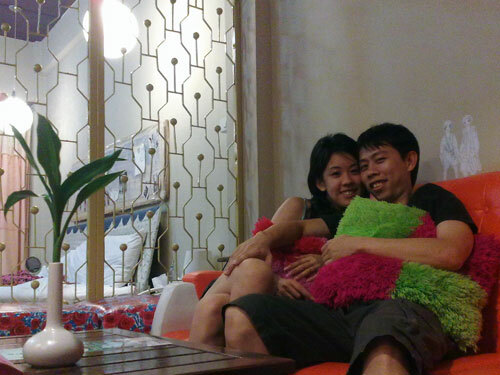 The room is much more awesome that we had expected, disco lights, funky furniture, eccentric decorations, soft toy chair. We are encouraged actually to paint the walls too. I have tonnes of pictures taken with the el big-o camera but you’ll have to be satisfied with this one taken by the camera phone for now. We went to Siam Paragon today and watched Confessions of a Shopaholic. Which was awesome( (Mell’s word, ok I agreed). It was my first time having to stand up in a cinema while the images of the King came up (last I did was when they used to play Negaraku in local cinemas). Tomorrow’s destination is Chatuchak weekend market. Lets hope we wake up early enough to enjoy the free breakfast. Last Monday marked the first time I spent less than 24 hours in a foreign country that isn’t a flight transit. I left KL on the 3:40pm flight to attend Showcase Nokia 2009 event at Singapore, and took the 6:45am flight back home the very next morning. In all I spent about 14 hours in the city state but it was fantastic. The only regret I have was not being able to spend more time with the fantastic hospitality offered at Mandarin Oriental Hotel. That luxurious king size bed with the most comfortable mattress, the excellent city view (free upgrade to deluxe or something), and that bathtub. Oh well, lets get back on topic lest I digress. The event was held at Zirca, Clark Quay, a more fashionable part of town when it comes to night life. 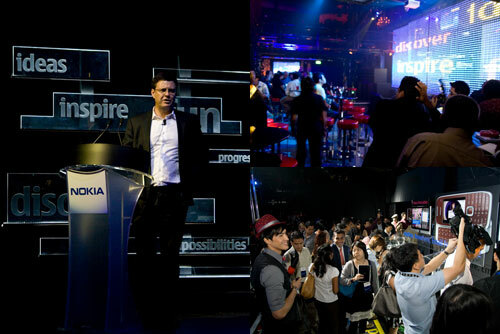 As the name suggest, Showcase Nokia is traditionally an event where Nokia showcases their upcoming products and services. Even amidst the currently gloomy global economy situation, the company did not fail to impress with their upcoming product planned for release later this year. Chris Carr, the VP of Sales from Nokia delivered the announcements of new products and services with a somewhat lengthy but very informative presentation. Instead of merely flooding the market with more and more handsets of different configurations and ever increasing capabilities. Nokia seems to be taking a slightly different approach by offering services that works in conjunction with the devices. A very good blue ocean strategy if you ask me. Nokia target in the near future is email for the masses. Most of us was thinking why would Nokia start concentrating email while almost everyone who is reading this already has several email accounts. 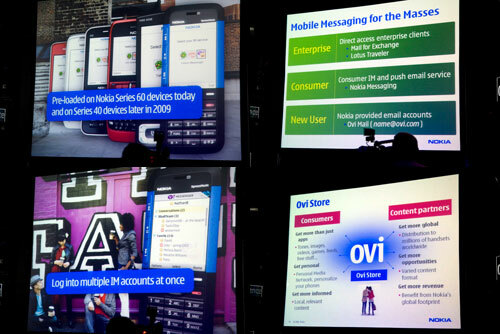 At the same time, Nokia is also working to bring other mail services on their devices. Personally I am already using Mail for Exchange and loving it, give me the ability to log into multiple email accounts in one interface and I’ll be a very happy person. I can’t wait for that. The other messenger centric announcement was the ability to log into multiple IM accounts with a single device. Something meebo and ebuddy is already doing, but I am hoping Nokia would do a better job in merging the different protocols together. Another service announcement from the company is the Ovi store. Something that is long overdue if you compare to Apple and it’s iTune store, but it is finally here nonetheless. The store will incorporate some social networking elements in it, this could be interesting. Of course, a showcase Nokia is never complete without the announcement of handsets, and this time around we have quite a few offerings. On the business front there is the E55 and E75. 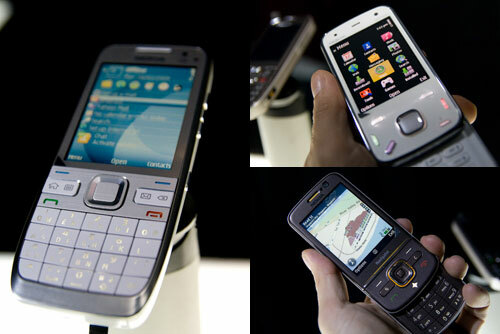 There’s the N86 as the latest addition to the impressive N series product line. The 6710 Navigator for the road warriors. The 6710 Navigator with the slightly curved profile as if the second coming of the old banana phone that so many adored. There are also 3 other classics – 6700, 6303, and 2700 to complete the range. these models are too tall! 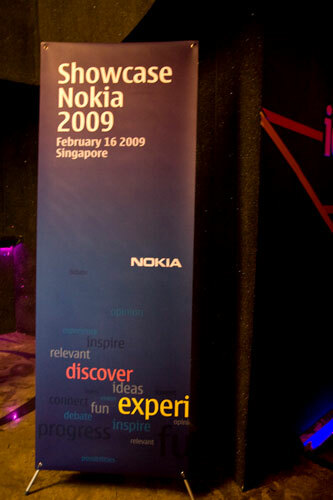 The N86 is a successor to N85, but to me, not a very pure successor to my trusted N82, which is still the only offering from Nokia with a Xenon flash. The reason given by the head of marketing, Bambos Kaisharis was that the dual LED flash in the N86 are strong enough for normal photography and yet still be able to operate while shooting video. Something out of Xenon flash’s capability. N86 comes with a whopping 8 megapixel camera with variable aperture (a first in mobile phone, but unfortunately we aren’t allowed to adjust the aperture manually) and up to 1/1000s shutter speed. Together with the 8gb internal memory and OLED display, it certainly look pretty impressive, but I’ll have to test out the production version when it comes out before (maybe) relegating my N82 to second place as the best camera phone. The Nokia 6710 Navigator is the first phone that comes bundled with ‘drive and walk’ navigation software that works with Nokia maps. Previous navigator (and N series) phones are bundled with Maps but you have to purchase the navigator add-on separately. I wonder why it took Nokia so long to do this, shouldn’t it be obvious from the get go that navigation software is essential for GPS? The ‘drive’ capability is limited to the home country while the ‘walk’ works everywhere in the world. The capabilities come with the device and does not have an expiry date. Too bad they don’t offer the option to buy a one time license for the ‘drive and walk’ navigation software to be installed in other Nokia phones. Don’t let the “classic” in 6720 fool you into thinking that this is a low end device. It comes with 5 megapixel camera, GPS, and that slightly curved side profile for better fit to your face. I think the curve is a little too minor to actually offer any significance, but it sure looks nice. To me, the most important feature in 6720 Classic is the active noise canceling and it’s huge battery that allows up to 20 days standby time. I would love to see active noise canceling technology in future XpressMusic range too. 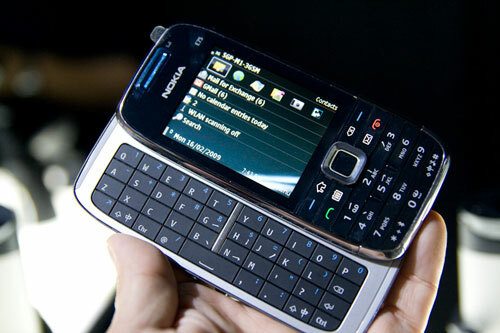 The most promising device of the evening must be the E75. This baby offers traditional alphanumeric keypad as well as a slide out qwerty in a normal phone size that does not make you look like you’re talking to a water bottle (E90, anyone?). The phone also comes with 3.2 megapixel camera, GPS, and a 4gb memory card, which is sufficient as a business oriented phone. I can’t wait to play with the production model that should arrive within Q1 this year. As for the 3 classic phones, they are just devices to cover the lower end of the market, I shall not bore you with the details. Overall the event was pretty interesting, we even had a Q&A session with 3 experts from Nokia (Sirpa Ikola, Raj Sambwani, and Vincent Julien), each of them in charged of a different category (navigation, software, connect). We talked about how data charges remain an obstacle to wider adoption of mobile phone as a data accessing device and cleared up many questions we had. Overall it was a pretty interesting and certainly informative event. I’d like to thank Hazel from Nokia and David from text100 for the invitation. I’m heading to Bangkok tomorrow, this time on a personal chillax trip with Mell. Can’t wait!